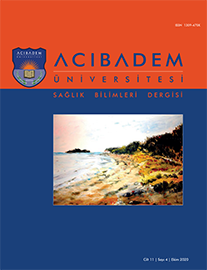 5Özel Altunizade Acıbadem Hastanesi Üsküdar, İstanbul, Türkiye Aim: The study was conducted to determine genital hygiene behaviors and resulting health status of female students staying in a university dormitory. Material and Method: The study was conducted with 723 students residing in a hostel at a state university, who agreed to participate in the research. The data were collected by using a questionnaire alongside a face-to-face interview. Statistical measures (numbers, percentages, mean, standard deviation) and chi-square test were then used to analyze the data. Findings: 29.2% of students are applying the wrong technique (from behind to front) in cleaning their genital area. More than a quarter of the students (27.1%) clean the genital area using soap and water. In the study were found that nearly half of the students (41.8%) did not wash their hands before entering the toilet. 56.7 % of students use cotton underwear. 78.0% students reported using pads for vaginal discharge. At present, the students" most frequent complaint was of urinary tract infection (UTI) and fungal infection. 60.7% of the students who have a complaint of infection of whatever cause (characterised by frequent urination, lower abdominal pain, excess foul-smelling vaginal discharge, vaginal itching, burning during urination) did not engage in help-seeking behaviour.